- Not because of the quality of the show but more because of the way that it was organized. Because we had such a good turn out the last time we had the Nanta discount deal, Henry and Herbie managed to talk to the manager, and we were able to get 30 discounted seats for Fever Night. Originally the 30 seats had to be in some combination of 1st and 2nd floor. Then, some other organizational issues popped up from the Nanta side (e.g., no 2nd floor seats being available, emerging the 8:00pm show with the 10:30pm show, etc. 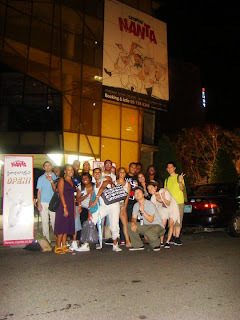 ), but DealiciousKorea was lucky enough to use the opportunity to get all of our 30 seats as 1st floor seats. Now, the deal seemed to be working out perfectly, and since we had done the same event before, the DealiciousKorea gang decided to focus more of our time on working on the website and specifying the Busan Trip. Yeah..The show time was 8pm. We wrote 8:30pm. We had 8:30pm on for 2 weeks. None of us saw it. We missed 2 people our guest list. First time that has ever happened, and something that will never happen again. All in all, despite the mishaps, the show itself was wonderful, and we were once again reminded that this was THE must see show in Korea.